Once again, the Distributed Proofreaders project has produced a new Project Gutenberg text from one of the Motor Stories adventures in our Digital Library. 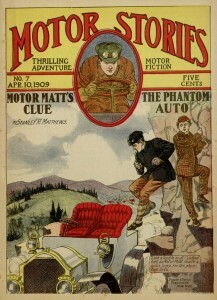 Motor Matt’s Clue; or, The Phantom Auto, the seventh tale in the series, has our young heroes confronted by a mysterious self-driving car and involved in a dispute over a will. Even more than the previous volumes, this adventure foreshadows later series fiction like the Hardy Boys and the Three Investigators (not to mention Scooby-Doo) with its apparently-supernatural mystery unraveled by plucky youths. As usual for the series, the main adventure is followed by some filler material. The first piece is a tale of the Civil War called “Bill, the Bound Boy,” which, based on newspaper appearances, seems to have been written in 1892 or earlier — well before its 1909 reprint here. The second piece is called “A Winter Story of Colorado,” about a mysterious pack of animals that are killing livestock. This appears to have originated in the Youth’s Companion under a different title, if a 1907 appearance in The Cato Citizen (PDF link) can be believed. All of this content can now be read online (or downloaded in popular electronic formats) at Project Gutenberg.